Our photovoltaic solar panels and inverter was installed last week (March 27, 2009). We eventually selected a 1.5kW, 9 panel system. Our roof faces North and is generally not shaded by trees. 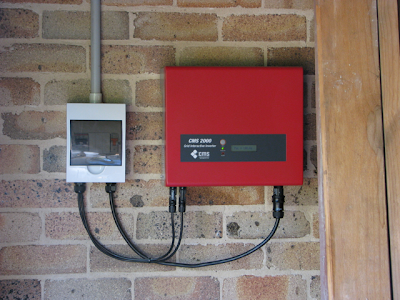 A 2kW inverter was installed in the garage to convert the DC power into AC. The output of the inverter is connected to one of our three-phase power circuits. The inverter (I am told) switches off during a blackout for safety reasons. Otherwise if there is enough power from the panels it supplies power to our house and any excess is 'pumped' into the grid to supply our neighbors. The unit seems to start working even if there is just 20W available. Our household electric energy consumption is about 6 kWh per day. So this system should generate enough energy, on average to supply most of our electricity requirements. Currently in NSW the energy fed into the grid is purchased by the electricity retailer at the same rate that they charge us so, in theory, every kWh we generate will reduce our bill by about 17c. I believe that this will rise to over 20c in July 2009. It is hoped that NSW will establish a higher feed-in rate as some other states have done in Australia. Most pay at least 44c per kWh for excess generated capacity. This is called a Net feed-in tariff. 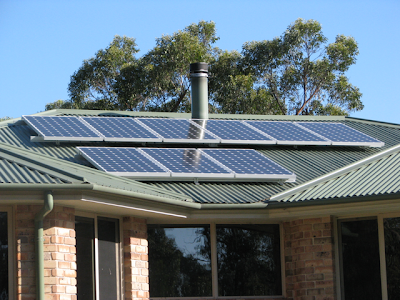 The ACT pays 50c for every kWh generated which is called a Gross feed-in tariff. The metering has not been done yet so we have one meter that generally runs backwards and the digits also count down so, although the feed-in meter is not installed, we are benefiting from our excess generated energy - if they take it into account. Our existing meters will be replaced by a poly-phase power meter and an additional feed-in meter will be installed.